Sometimes reforms can lead to new problems. In the past year the federal government has taken measures to protect foreign workers bound for or already in Canada, and the integrity of our immigration system, by implementing more detailed screening of employers. This is aimed at rooting out fake job offers and reducing exploitation of such employees. The government has also speeded up the Work Permit renewal process. These are worthy achievements. Unfortunately, in practical terms they are like oil and water. They don’t mix together, and a whole new crop of problems has arisen due to the interplay of the two. What is a Work Permit? How is it renewed? A Work Permit (WP) grants a foreign national the right to work in Canada for an employer for a temporary period of time, usually two or three years. As a general rule, unless a foreign worker falls within certain exemptions, which would take another entire article to describe, a complicated set of procedures must be followed as a pre-condition to renewing the employee’s WP. This normally requires advertising to ensure that Canadians or permanent residents have an opportunity to apply for the position, then requesting a Labour Market Opinion or LMO from Service Canada. In Quebec, there is an additional requirement, which is that the employee must apply for and obtain a Quebec Acceptance Certificate or CAQ. Flash forward to winter 2012. The new LMO screening procedures in place since summer 2011 have led to increased processing times at Service Canada, even doubling in some Canadian centres to three or four months or longer. Naturally more documents to review means longer processing times. But due to the improvements in the WP renewal process at Immigration Canada, processing times there have been reduced from three or four months last year to less than one month today. On top of all this there is apparently an internal directive at Immigration Canada whereby WP renewal applications will not be kept on hold for more than 60 days when the file is missing the approved LMO, and for Quebec files, the CAQ as well. As a result, once the 60 day limit is passed, since their old WP has expired and their WP application is now being refused as incomplete, individuals are losing their right to work in Canada, at least temporarily. At the same time, employers are being placed in very difficult situations when they are legally obliged to suspend employment of such employees who may occupy key posts in their businesses. The only possible solution in such a circumstance is to wait for approval of the LMO (and CAQ in Quebec), then make a new WP application combined with a special request to Immigration Canada to restore the employee’s legal status in Canada. Such further procedures will take another month or longer. Naturally, when applying to restore status, Immigration must be convinced that the employee did not work illegally at any time he or she was without a valid WP. Now it must be kept in mind that restoration of status is a privilege, not a right, and can be refused. The lesson in all of this is that procrastinators may well lose out, with the employee having to leave Canada and the employer obliged to start searching for someone new to fill the job. The wise employee and employer must be vigilant in Immigration matters. Considering the long combined processing times for advertising, then the LMO and CAQ (if for Quebec), then the WP, and to allow for possible problems, it is highly advisable to start working on the complicated renewal procedures at least six or seven months prior to the WP expiry date. 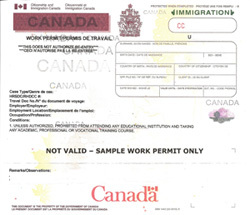 Photo: Sample of a Work Permit. The opinions expressed herein are those of the author and do not necessarily reflect the views of any other person. A slightly modified version of this article first appeared in the Winter 2012 newsletter of the Ireland-Canada Chamber of Commerce, Montreal Chapter, www.icccmtl.com.